Have you ever wondered how long it took to design your beloved running sneakers? As consumers, we tend to focus on the basics: colorways, purpose, and fit, but there’s a lot that goes into designing a sneaker for maximal performance. 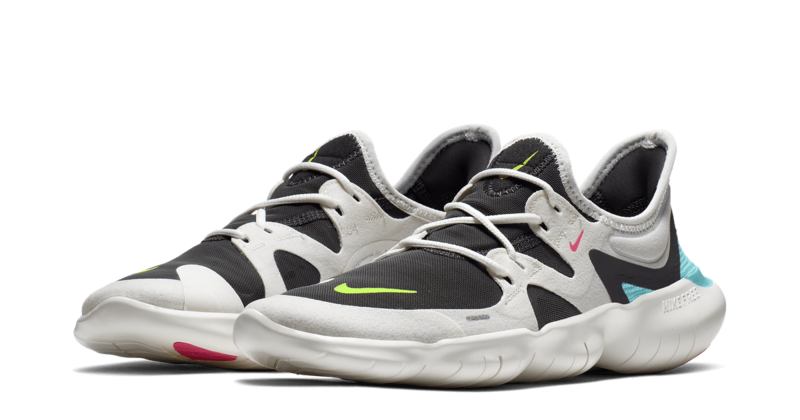 For Nike, the creation of the first Nike Free came to fruition in 2001 after designers saw runners at Stanford University cooling down barefoot in the grass. With the hypothesis that barefoot running could improve foot health, Nike researchers began studying barefoot running in depth. After three years of researching and designing prototypes, the first Free model was born. Today, 15 years later, Nike has continued studying the foot — how it moves and the pressure applied when striking the ground, which led them to revamping the outsole design of the Free. Their research found that when your foot loads (strikes the ground), it expands and contracts from heel to toe and across the arch. Instead of restricting the foot and only allowing for heel-to-toe flexion, as in previous models, the new Nike Free 5.0 ($100) allows your foot to expand across all planes; from heel to toe and across your arch. The new Free is also 26 percent more flexible and two millimeters lower to the ground, for those who enjoy the science that goes into creating a shoe. Now, we have even more respect for our favorite running shoes. “We really want to pull Free back to that original insight, which was really unlocking the barefoot and letting the foot do more of the work. And the shoe just kind of is the vehicle that allows you to do that,” Brett Holts, vice president of running footwear for Nike, told POPSUGAR. If you think the Free is only for elite levels athletes, you’re wrong. “If you have a body, you are an athlete,” is Nike’s mission statement after all. Because Free 5.0 provides a barefoot feel, you’ll want to ease your way into how you use it. That means you shouldn’t run a marathon in it on day one! Nike experts recommend starting by resetting your foot and wearing the shoe around your house and throughout the day. After your foot gets acclimated to the Free 5.0, they recommend wearing it on your low-mileage running days like jogging and low-mileage track workouts. To get the max benefits of the Free, Nike experts recommend pairing it with the Nike Epic React, Nike Pegasus 36, or the Nike Pegasus Turbo for your mid- to high-mileage runs. For race days, Nike experts suggest the Nike Zoom Fly or the Nike Zoom Vaporfly. Check out more pictures of the Nike Free 5.0 ahead and shop the full collection on Nike.com. Travel and expenses for the author were provided by Nike for the purpose of writing this story.